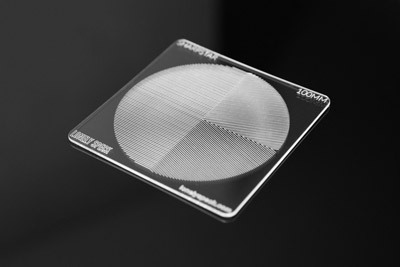 ISO is one of the three major exposure settings in the exposure triangle of a digital camera. Of the three: shutter time, f/number, and ISO, it is ISO that is probably most misunderstood. Even more so than f/number. In fact, it is a common misconception that higher ISO settings will cause images to be noisier. In fact, the opposite is often true. Wait, what? That’s right, higher ISO settings alone do not increase image noise and higher ISOs can even be beneficial to low-light photography. In this post, I talk about the craziness surrounding ISO settings, how ISO actually affects exposure and how to find the optimal ISO setting on your camera for astrophotography. This article is the first of three articles in the Astrophotography 101 course about optimizing exposure. Futures articles on shutter time and aperture f/number will follow. Learning how to optimize exposure settings is one of the most helpful skills when attempting astrophotography. “What exposure settings should I use?” is probably the most common question I get. For beginners who are new at trying astrophotography with their regular digital camera and lens, I usually recommend starting with my Milky Way Exposure Calculator. That calculator will provide an excellent starting point when making your first attempts at shooting the night sky. In digital photography, ISO is a standard (specifically ISO 12232:2006) for exposure brightness developed by the the International Organization for Standardization (ISO). Different camera sensor models have different sensitivities so we need some way to correlate them so like exposures yield like brightnesses. Some people pronounce each letter (aɪ-es-o) but that’s technically incorrect according to the organization for which it stands. It’s correct (and easier) to just say it like the two syllable word aɪso. Signal is the part of the photograph that we want. Light is signal. Signal is the image. Without the signal (without light), we can have no image. The more light that we can gather, the more signal we have. In general, the more signal, the higher the quality of the photo. Noise is the part of the photograph that we do not want. Noise is interference appearing as speckled grain that obscures the signal and thus the details of the photograph. Noise is usually generated by heat or imperfections in the behavior of the electronics of our digital cameras. Some noise is random with every shot (shot noise) and some noise is produced consistently by the camera’s sensor (upstream read noise) or produced by the electronics after the sensor’s signal has been amplified (downstream read noise). In general, the more noise, the lower the quality of the photo. The ratio of signal to noise in an image. The higher the signal-to-noise ratio, the higher the quality of the image. More light = more signal = good. More noise = bad. Collecting more light is the best way to increase signal-to-noise ratio. 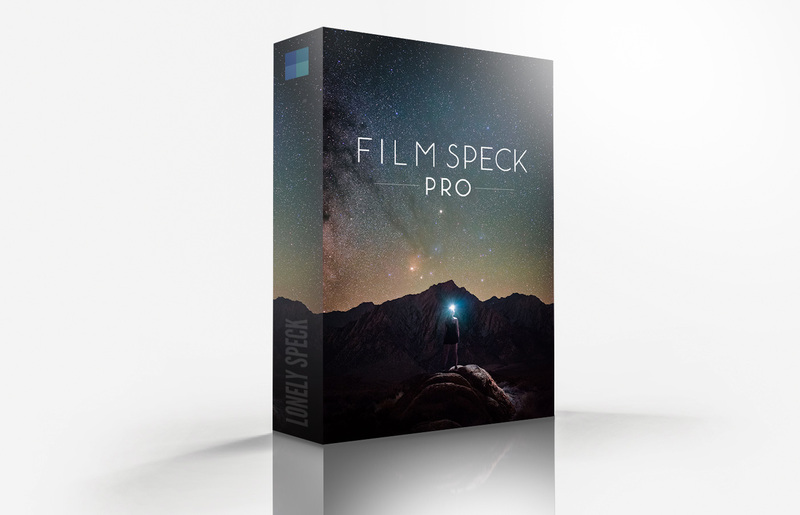 The full range of light of a scene, from the darkest darks to the brightest brights. A high dynamic range scene has extremely bright highlights (such as the sun) and extremely dark darks (such as a fully shadowed black rock). A low dynamic range scene has relatively uniform light across the scene where the brightest parts of the image are not much brighter than the darkest parts of the image. Cameras only capture a limited dynamic range of light. If the dynamic range of a scene is high enough, anything outside the range of the camera’s sensor will either be blown out to pure white (in the case of very bright areas) or crushed to pure black (in the case of very dark areas). In general, a camera sensor capable of capturing a higher dynamic range of light is more desirable. A disclaimer: I’m an engineer, but I’m formally and primarily trained in mechanical engineering. I have some relevant experience, but electrical and computer engineering isn’t my main mode of expertise. My intention with this article is to simplify these concepts in a way that hopefully makes sense to a larger, non-technical audience. If you’re familiar with this topic and you see any glaring mistakes in this article, please feel free to let me know. Also, all of the points made in this article apply to RAW image files. It’s very important to shoot astrophotos in RAW format to preserve the best data collected by the sensor. Don’t start complaining when you try any of the tests in this article on your JPEGs. Also, much of the benefit of optimizing ISO selection applies primarily to low-light shooting (like astrophotography) where we have a relatively small amount of signal competing with the various noise sources that encroach upon our photographs. It’s a (very) common misconception that increasing ISO increases the sensitivity of a camera sensor. ISO doesn’t change sensitivity. Increasing ISO simply increases the brightness of a photo by amplifying the sensor signal. In the electronics world, amplification is sometimes called “gain.” Like we can “gain” weight if we increase our eating, we can “gain” brightness if we increase our ISO. ISO in no way affects how much signal (light) the camera can collect. If we actually want more sensitivity with a camera, we need to either increase shutter time or aperture size (lower the f/number). OK, to the main point: Higher ISOs won’t increase the visible noise in a photo. For most imaging situations, photographers will usually use P (Program), A/Av (Aperture Priority/Aperture Variable), or S/Tv (Shutter Priority/Time Variable) modes on their camera. In these exposure modes, using a higher ISO setting will result in an image with more relative noise. What most people don’t realize is that the increase in noise is not because of the increase in ISO. The increase in relative noise when using a higher ISO in an automatic exposure mode (like P, A/Av or S/Tv) is actually due to the reciprocal decrease in shutter time or the decrease in aperture size as a result of using an automatic exposure mode. Most people are misattributing the increase in noise to the ISO when it’s actually caused by lower signal-to-noise ratio due to the shutter or aperture. When setting a higher ISO on one of these autoexposure modes, the camera tries to achieve a neutral exposure and compensates for the increase in ISO by decreasing the amount of light entering camera. This reduction in light is done automatically by the camera by either decreasing the time the shutter is open (when in A/Av mode) or by using a higher f/number and thus decreasing size of the lens aperture diaphragm and letting in less light at a time (when in S/Tv mode), or by a combination of both (when in P mode). So a reduction of light by the shutter or the aperture is the reason that the image appears noisier. It’s not noisier because of the higher ISO. This reduction of light is a reduction of signal and a reduction of signal yields an overall lower signal-to-noise ratio and thus a noisier photo. How Do Shutter, Aperture and ISO Affect Noise? A simple comparison test can show that relative noise levels are primarily affected by shutter and aperture and not affected nearly as much by ISO. In these tests, all settings are kept identical except the one that we wish to test which is adjusted by two stops. Then, in post processing, the images are equalized in brightness and compared. So of the three tests on my Sony a7S, shutter speed and aperture very obviously directly affect the apparent levels of noise in the photograph while ISO has nearly no effect. This is completely contrary to what many people would expect when they think about higher ISO. In low-light photography, there is one aspect of ISO that can greatly affect the amount of perceived noise for any given ISO setting: downstream electronic noise. Let’s see how different types of cameras can be affected by downstream electronic noise. There are variations from sensor to sensor and camera model to camera model in how ISO affects low-light images. Understanding how your camera sensor behaves can help you find the optimal ISO setting for astrophotography. There are two fairly common configurations that we see in most modern digital cameras so we can split most cameras into one of two camps, ISO-variant and ISO-invariant. Cameras use varied levels of analog amplification to adjust ISO. In a simplification of this case, the amplifier boosts the electronic voltage readout from the sensor by 2x for each ISO: 100, 200, 400, 800, 1600 and so on. Higher ISO means more amplification of the sensor output data. After the sensor data is amplified by the ISO, it’s sent through some (downstream) electronics (such as an analog to digital convertor) to ultimately change our data from voltages into a digital file of numbers that’s readable by a computer. One of the distinct characteristics with ISO-variant cameras is higher contribution of noise from these downstream electronics. If there is relatively little signal to begin with (e.g. in low-light situations), the lower ISO settings might not apply enough amplification for the voltages of the sensor data to overcome the contribution of electronic noise made by the downstream electronics. 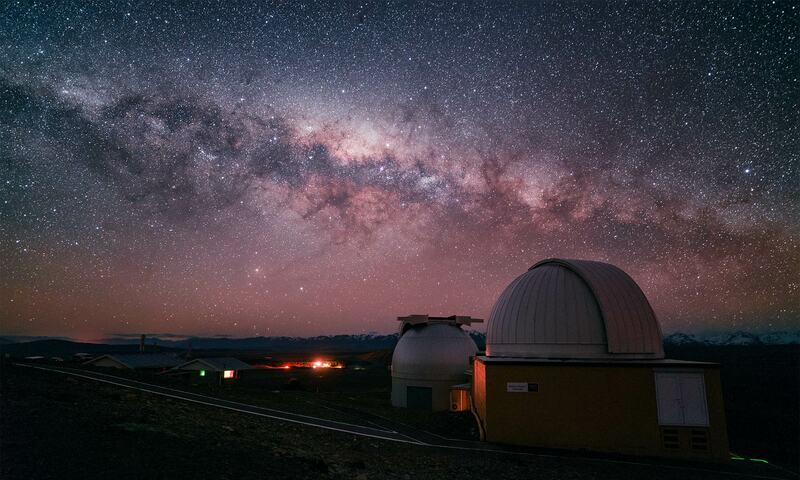 That means that in low-light situations like astrophotography, ISO-variant cameras will actually show more noise at low ISO settings and less noise at higher ISO settings. The Canon EOS 6D, still one of my favorite choices for a DSLR for astrophotography, is highly ISO-variant and actually shows its best low-light noise performance at ISO 6400 and higher! The Canon EOS 6D is highly ISO-variant and achieves its best low-light noise performance at ISO 6400 and higher. Most Canon DSLRs are highly ISO-variant. There are a few exceptions to the Canon lineup that are not as ISO-variant including the new Canon EOS 5D Mark IV and the Canon EOS 80D. ISO-Invariant cameras have lower downstream read noise such that in low-light shooting conditions, the signal to noise ratio stays more constant as ISO settings change. In a simplification of this case, the sensor data is already amplified above the minimal contribution of downstream read noise sources before being converted to a digital signal. The result is a camera with low ISOs that tend to have less shadow noise and less of a variation between ISO settings. Most of these types of cameras are considered relatively ISOless or ISO-invariant. One camera that shows a great example of ISO-invariance is the Fujifilm X-T1. An example of the X-T1’s ISO-invariance test is available at the end of the article. Modern digital cameras made by Sony and Fujifilm tend to be relatively ISO-invariant. Okay, it’s not all black and white: many ISO-variant cameras eventually act like an ISO-invariant camera above a certain high ISO setting. Above some threshold ISO, these cameras fully overcome their noisy downstream electronics and show minimal difference in signal-to-noise ratio with higher ISOs. Most Canon cameras act this way above about ISO 1600. Knowing what that threshold ISO setting is can help us achieve the best low-light performance. Similarly, many ISO-invariant cameras may have one or two distinct jumps in gain that will affect the overall read noise contribution to the image. In this case, there may still be a threshold ISO above which it is beneficial to shoot in low-light conditions. The Sony a7S acts this way with changes from approximately ISO 100 to 200 and 1600 to 3200. The Sony a7S’s best low-light performance is actually around ISO 3200 and above. Otherwise, the differences between ISO settings in low-light conditions on the a7S is relatively minimal. Ultimately, both configurations achieve the same goal of brightening the photo to correspond with the particular ISO setting but the end result can be quite different, especially when shooting in low-light scenarios. ISO-invariance is a distinct enough trait in the behavior of a camera that dpreview.com has added an ISO-invariance test to most of their latest camera reviews. I personally think it’s very helpful to know how a camera acts in order to find out where it will perform best in low-light photography. One of the distinct negative aspects of using too high of an ISO is reduced dynamic range. The more that we amplify the data that makes up a digital image, the more that we risk brightening it so much that it blows out the brightest parts of the image to pure white and loses detail in those parts of the image. In the dynamic range test below, I made exposures of the star Antares at the highest ISO settings of my Sony a7S using the same exposure settings and varying only the ISO. As the ISO increases, the star appears to get larger because it’s being gradually more and more overexposed with each higher ISO. In practice, with the Sony a7S, the reduction in dynamic range doesn’t become too much of an issue until about ISO 51200 and higher but the difference in each stop is still apparent. As a side-note, notice how similar most of the ISO settings between 1600 and 204800 look to each other in terms of noise, especially relative to the Canon EOS 6D sample above. 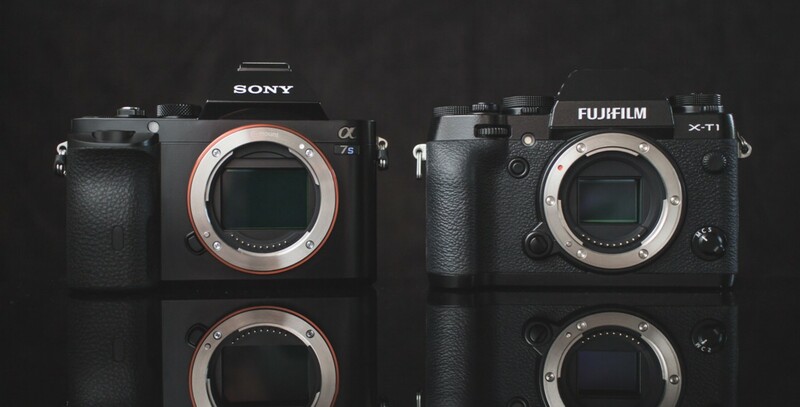 The Sony a7S is a fairly, although not completely, ISO-invariant camera. In my experience, except for the brightest stars, blowing out any part of an astrophoto to the point where we’re losing a lot of data is very, very rare. 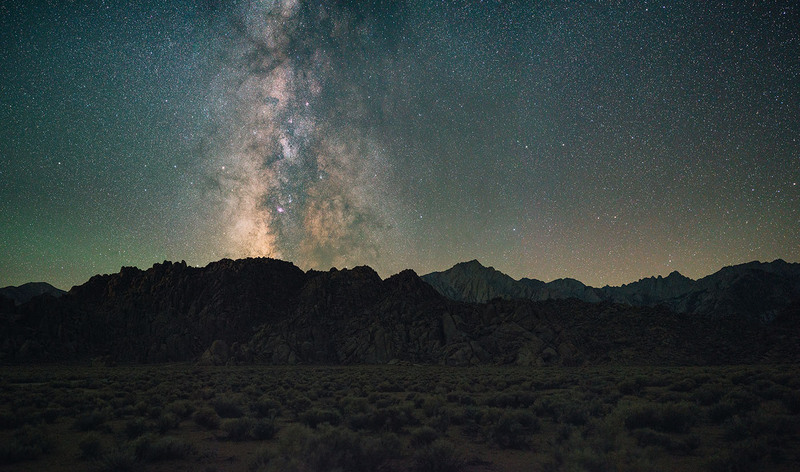 The bigger risk of using too high of an ISO in landscape astrophotography occurs when there is a larger, brighter (usually artificial) light source in view of the shot such as a street lamp, light pollution from a nearby town or your buddy’s headlamp. Since we lose a little bit of highlight data with each higher ISO, choosing the optimal ISO for astrophotography is a little bit of balancing act between using a higher ISO for better noise performance (especially in the case of an ISO-variant sensor) or a lower ISO for better dynamic range. Stand back, we’re going to try science! In order to find the best ISO to use for astrophotography, I recommend doing an ISO-invariance test. Most of the samples shown in this article up to this point were made with an ISO-invariance test. It’s a super easy test to run: all we need to do is to take about 7-10 RAW photographs, one at each whole-stop ISO and then we match the exposure brightnesses in post processing. This test is easier to perform in a low-light scenario so I recommend doing this test outdoors at night or in a dimly lit room. Maybe make it an astrophotography trip. 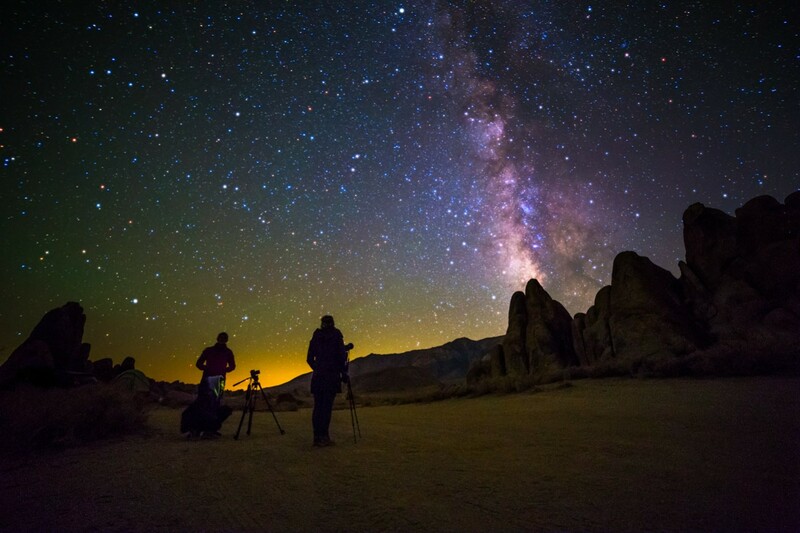 If you’re performing this test while shooting the dark night sky, use my Milky Exposure Calculator to determine the shutter time and aperture setting. If doing the test in a dimly lit room, first use your camera’s (P) Program exposure mode at ISO 3200 to determine your shutter time and f/number. Shoot in RAW file format! 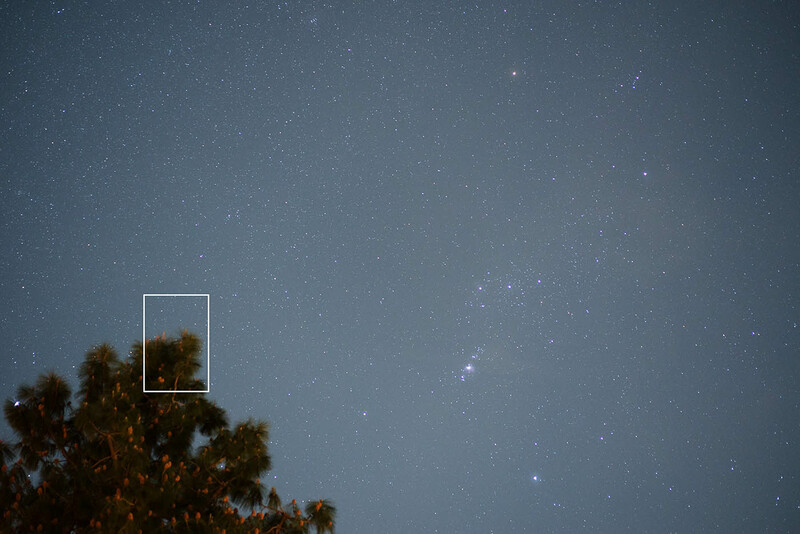 For my test on the T5i, here’s what the complete images looked like with the crop of the test area highlighted. I cropped the results of the test to a small area that included some midtones and some shadows. 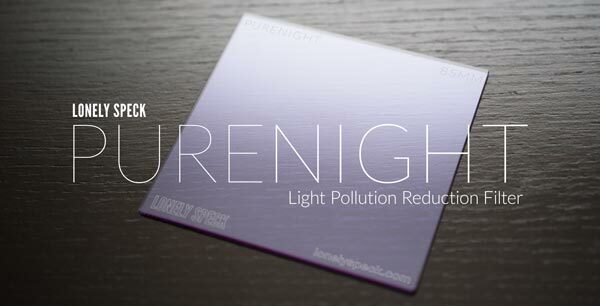 Here’s the complete summary of how we match all the exposure brightnesses in Adobe Lightroom. Another way to do this in Adobe Lightroom is to select all of the exposures, then highlight the ISO 3200 exposure and select Photo > Develop Settings > Match Total Exposures or press Command+Option+Shift+M (Ctrl+Alt+Shift+M). Upon comparison of the exposures, it’s immediately apparent that the Canon EOS 700D/T5i is not completely ISO-invariant. It appears as if that the camera reaches its best low-light performance at ISO 1600 and higher. ISO 1600, 3200 and 6400 look almost identical meaning that the 700D might be ISO-invariant from ISO 1600 upwards. Below ISO 1600 is a different story: As the ISO lowers, image quality degrades until the point of being nearly unusable at ISO 100. In order to preserve some dynamic range, but still get the best low-light performance on the 700D, it’s clear from the results of the test that ISO 1600 is the optimal setting. Just for comparison, I ran a separate ISO-invariance test on my Fujifilm X-T1, this time at 30 seconds and an aperture of f/2.8. The results are distinctly different from the Canon. The difference is that there is no difference… between the ISO 200 setting (the lowest it goes on the X-T1) and the ISO 6400 setting, noise levels are identical. This means that the Fujifilm X-T1 is completely ISO-invariant. The noise levels across the ISO range don’t change in the slightest. This means that it doesn’t really matter which ISO you use on the Fujifilm X-T1 and the optimal setting might even be ISO 200 in order to preserve dynamic range. That said, there’s also a little bit of impracticality if attempting to shoot astrophoto at ISO 200 as the image preview on the back of the camera would be very dark and evaluation of other important factors like focus and composition would be difficult at ISO 200. Luckily, we’re usually not risking too much dynamic range by bumping ISO up to a moderately high level, assuming there are no bright artificial light sources in the photo. So using ISO a slightly higher ISO might be the more practical choice, keeping in mind our tolerance for reduced dynamic range. Contrary to popular belief, higher ISOs don’t create more noise and using a higher ISO can actually be beneficial when shooting in low-light scenarios, especially on cameras with ISO-variant sensors. Run an ISO-invariance test on your camera to determine the best ISO setting to use when shooting astrophotography. 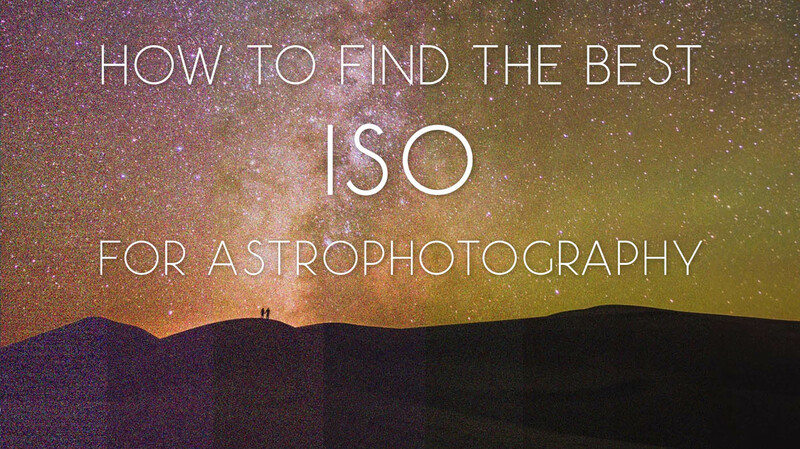 ISO behavior varies from camera model to camera model and testing out each ISO setting can help determine the best ISO to use for the best noise performance in your astrophotography. It’s important to understand that ISO-variance or invariance doesn’t necessarily make a camera better or worse at low-light, it’s just different. Knowing how a camera behaves is an important step to achieving the best image quality. More and more cameras manufacturers tend to be making their cameras more and more ISO-invariant, as they develop sensor technology with reduced downstream read noise and improved dynamic range at low ISO settings. 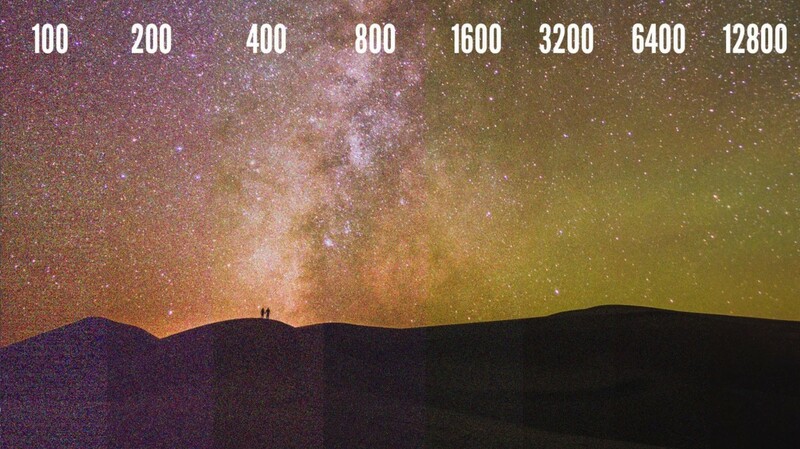 Do you know which ISO on your camera gives the best low-light performance? Do a test to find out! *This article was edited on March 20, 2017. A previous version of this article incorrectly characterized certain aspects of ISO-invariance. This point has been corrected. I thought the amplification itself introduced more noise (less accuracy)? Another thing is, what is correct signal detail. Noise averages, making things look more inauthenticly even then what I s real signal. I see you have removed some noise reduction, but these Sony circuits have in circuit noise reduction as well, and whatever other reductions not visible to the menu. The optical low pass filter and debayering routines also average out signal. You can increase the take up of signal apart from amplify this finale signal, and even decrease the light input on some sensors. In old electronic news gathering CCD cameras they had high gain for nightime shooting which increased noise. So, I don’t think it is always the case that high gain doesn’t increase noise. I remember is deep field imaging sensors, there was a type of sensor which amplified the actual signal while holding down noise. This was the exception rather than the rule. So, is there really no increase in noise or are we simply looking at cameras that better handle noise, and averaging Ian? For the “How ISO Affects Noise” section, why did you decide to overexpose the photo with the ISO and then bring the exposure down in post? As opposed to underexposing the photo and bringing up the exposure in post. Because of course you will have less noise when you are decreasing exposure in post compared to increasing it…. Follow up question – does this all only apply to iso-invariant cameras then? Because in your Canon T5i test, if only aperture and shutter speed affect noise (and they were kept the same), shouldn’t all the photos have the same amount of noise? There are a few reasons. Firstly, it doesn’t matter which way you go. Push or pull, the point is comparing ISOs. Pushing is a lot more typical of most exposure conditions, particularly for night photography. Usually, the concern is not blowing out highlights and minimizing noise in the shadows and thus under exposing and pushing exposure in post is commonplace in most conditions/workflows so I think it’s an appropriate way to test. You could do the opposite: overexpose using equal shutter times and apertures, vary only ISO and then pull down everything to compare. The ability to compare will be retained in that scenario. Either way works. While aperture and shutter speed are the primary and overwhelming contributing factors to determine how much relative noise an image will have (less light = more visible noise), there can still be subtle differences between ISO settings on ISO-variant cameras. Most cameras aren’t fully invariant, so performing a test of ISO-invariance is a way to visualize any differences and help determine the most appropriate ISO setting in light limited conditions. Thanks for the reply, I think I’m starting to get it. So then how do you “prove” that ISO does not increase noise if you are using an ISO-variant camera? And also, how do you know that an underexposed photo taken at a lower ISO and boosting the exposure in post processing is not amplifying/introducing noise, in order to make it look similar to a properly exposed photo at a higher ISO (which you would think would have more noise)? I am at a loss after reading this and other articles on ISO sensitivity etc etc. What happens if one were to use a star tracker to shoot say the Milky Way. Should theu use a lower ISO or higher. Foe ex Canon 6D is less noisy at ISO 3200. What should the ISO setting be? 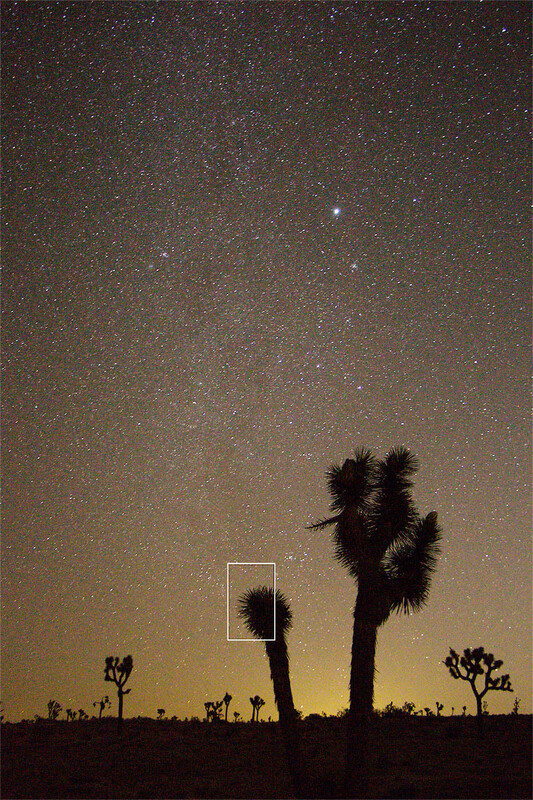 It depends on your approach to shooting the Milky Way with a star tracker. Some people take a really long exposure (up to 2+ hours) and others take multiple ~30 second exposures and then stack them in software on their computer. If you’re doing the long exposure method, I would use ISO 100 (base ISO). If you’re doing the ~30 second method, I would use ISO 6400 on a Canon 6D. In general, the best one to use, and the one I personally use, is the multiple 30 second exposure method (Really long exposures usually show increased thermal noise in their images). Therefore, by keeping my aperture and shutter speed at the same settings as if the camera weren’t on the star tracker, I would use ISO 6400 on a Canon 6D since that would show the least amount of noise with the best relative dynamic range (as shown above in the article). Keep in mind, ISO-Invariance is only applicable when shooting conditions (like astrophotography or any low light photography) restrict your shutter speed and aperture to force you to use an ISO higher than base ISO to properly expose an image to the right brightness. Ideally, we would all want to shoot at ISO 100 (or any base ISO) in all types of photography given the shutter speed and aperture produce a quality and properly exposed image because we would then have a really high signal to noise ratio where we would basically see no noise. In non-tracked astrophotography however, that’s just not possible with current technology since longer shutter speeds cause star trailing and larger apertures are harder to make and nonexistent to properly expose an image at ISO 100 (and current apertures are nearing their theoretical limits too). So in any type of photography, first set your aperture and shutter speed to get the best result based on your subject/method. Then set your ISO to get a properly exposed image. If this ISO setting happens to be above 6400 (the best ISO in our ISO-invariance test for a Canon 6D), then lower this ISO setting to 6400 and brighten the image in post to therefore get the best possible image with the least amount of noise and the best possible dynamic range. If the ISO setting is below 6400, then I would probably leave it at that setting, however ISO-invariance tests can also be useful here too. Say your shooting a landscape with dark shadows in the foreground and a really bright daytime sky. In this scenario, I might lower my ISO just a little bit to get more highlight data in the sky at the cost of little to no increased noise in the shadows when brightening them in post-processing if I used an ISO-invariant camera. If using the Canon 6D, I would not do this with the Canon 6D though since it is an ISO-variant camera. Is there any way to get some of this information on a pdf file? Brilliant study. I am planning to purchase a D7200, how much ISO should I set for 50mm f/2.8 for a milky way shot? For the D7200, ISO-invariance tests show that ~ISO 3200 is the best ISO setting when it comes to noise. However, the camera does perform pretty well down to ISO 400 if you are looking for more dynamic range in exchange for a little more noise. On a D7200, keep in mind you are cropping the image by 1.5x since its a crop sensor and paired with a 50mm lens, your effectively using a 75mm equivalent lens so your angle of view will be narrow when shooting the Milky Way. This will probably limit your shutter speed to around 8 seconds max if you don’t plan on tracking it so your image will probably be a bit noisy at f/2.8. I would recommend using a better lens like 50mm f/1.4 if you are looking for the same angle of view. Otherwise, wider angle lenses are best for Milky Way shots. Also, if your serious about Milky Way shots, I recommend going to a full frame sensor camera if you have the money. They do much better in low light since there is more surface area to collect more light (less noise in your images). The D7200 is a great camera (and the D7500 is slightly better in low-light too) so if your not quite ready or still learning, then you can’t go wrong with it either.